Honeywell HC26E1004 humidifier pad with Agion anti microbial coating, 3 pack. HE365, HE360, HE300, HE265, HE260, HE250 and HE200 Honeywell humidifiers. HC26E1004 water panel dimensions: 13" x 10" x 1-1/2"
The HC26E1004 humidifier pad is treated with an advanced antimicrobial coating that helps prevent the surface growth and migration of bacteria, mold, fungus and algae on the humidifier pad. This is the pad of choice if you are looking for superior quality and performance in your Honeywell humidifier. Proper humidification improves air quality, prevents dryness in your home and has many health benefits. Dry air, soar throat, itchy nose? Is it time to replace your Honeywell humidifier pad? A clean humidifier pad is one of the most important components of an effective and efficient humidification system. So it is essential to make sure that you are changing your pad routinely. During the humidification process the humidifier pad is coated with water. Over time calcium deposits crystalize on the pad breaking down the pad and blocking air flow. The time it takes for this to happen depends on your water condition and the run time of your humidifier. It is important to monitor your pad condition throughout the humidification season for your home. A good practice is to start with a new pad when you turn your humidifier on. 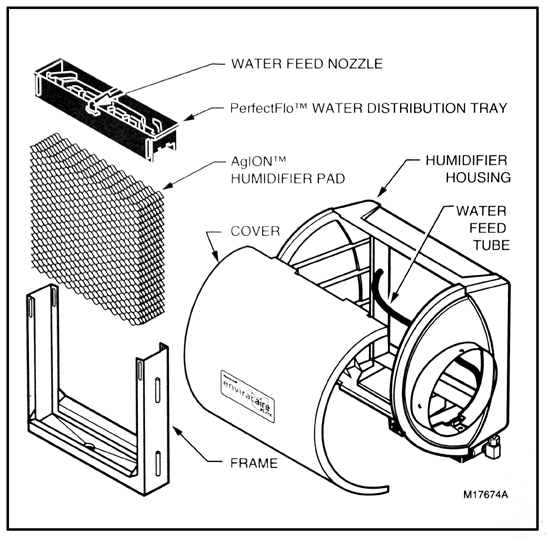 When the humidification season is over it is a good idea to clean out the humidifier including the frame, water distribution tray and drain. Please remember not to throw any of the components away except the humidifier pad itself. Then install a new pad so that you will be ready for the following season. If you live in an area where you use your Honeywell humidifier year round or for very long periods a good rule of thumb is to replace the pad approximately every three months. Replacement: For the best performance we recommend that the pad be replaced at least once a year, usually prior to the start of the heating season. If you have especially hard water or use your humidifier for extended periods of time (colder climates with extended heating seasons) it may be necesarry to replace the pad more often. When the pad has reached its life cycle the coating will start to crumble off or excessive calcium deposits (usually due to hard water) will form. It is important to avoid using pads in this condition as it can seriously inhibit the performance of your humidifier. HE365, HE360, HE300, HE265, HE260, HE250, HE200. Once a year. Or every 2-4 months if you have hard water or live in a colder climate. It is usually located on the bottom of the humidifier. We do carry many parts for Honeywell humidifiers. They can be found under Parts: Humidifiers. I am very happy wit my Honeywell humidifier I had installed a few years back. And I'm happy to have a place to buy replacement pads for it. I like to do the service my self and save money. Thanks for providing a convenient way to buy these pads. Like to stock up on these and save on shipping every year. Wish you guys had free shipping :( But I love that when I called in for help you spent 15 minutes on the phone with me figuring out the problem with my humidifier that wasn't your fault but an installation issue. Your tech guy rocked! Thank you for being so dependable. This is my 5th order with you guys. I order every 2 years and I always receive it days later via UPS. I wish it was this easy getting service like this everywhere. Click the button below to add the HC26E1004 Humidifier Pad w/ AgION Coating - 3 Pack to your wish list.